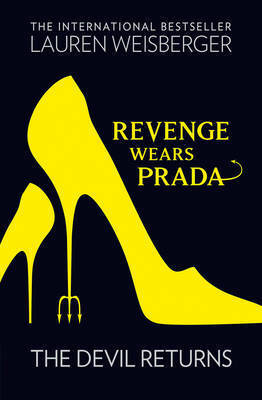 I was interested to read Revenge Wears Prada by Lauren Weisberger. It has been years since I read The Devil Wears Prada and I was curious to see where the tormented Andy Sachs and her diabolical ex-boss Miranda Priestly were now. However, the more I got into this book, the more I recalled how much the first book had annoyed me and how it was really the film version that I had fond memories of, not the book. I had forgotten how annoying Andy Sachs was and how unaware she was of the people around her. In Revenge Wears Prada, set 10 years after the first book, Andy has launched a successful high-end wedding magazine with Emily. She is also getting married to a wealthy and handsome man from a privileged family background. But is she happy? Of course not! The book opens with whining. Her husband clearly worships the ground she walks on but she would rather dwell on some perceived slight. I waited for this unfortunate intro to end and for the fun to begin. It didn’t. Next Andy gets pregnant and the reader is treated to her not wanting to tell her new husband and wondering if she should leave him because his mother doesn’t like her and he talked to an ex on his bachelor weekend. Then after pages and pages of that, finally Miranda enters the book – very briefly. It turns out she wants to acquire their wedding magazine. Emily thinks it is a great idea. Andy doesn’t. Pages of that and then lots of baby stuff. Then they meet Miranda and it isn’t really that interesting. Then after lots more moaning, Andy’s husband signs with Emily to hand the magazine over to Elias Clark and Miranda’s clutches. Finally, I thought. Now it will get interesting with Andy working under Miranda again. But no. Andy resigns from her magazine. One year later … she is divorced from her husband and doing something or other. Then she meets up with her original boyfriend Alex from The Devil Wears Prada and they decide to try again. The End. I don’t usually spoil the plots of books for fellow readers but this was just a disappointment and very misleading. It barely featured anything on Miranda – a character you love to hate. And Andy as a protagonist just wasn’t likeable in any way. It’s not worth spending 420 pages with someone you want to slap. I’m not tempted to read either the original or the sequel. I liked the movie – but only because of Meryl Streep. I’m not particularly fond of Anne Hathaway and her character in the book sounds even less appealing! Yep, I can see why you felt this one was spoiler worthy. Sorry! Ugh…how disappointing. Going to cross this one off my list!